The VEX Utility Rack prevents disorganized, messy classrooms and creates a clutter-free work environment. 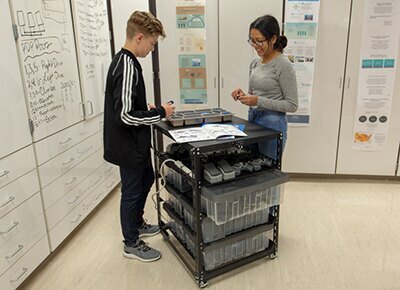 The rack was designed in collaboration with our sister company, VEX Robotics, to give students, teachers, and coaches the ability to organize, store, and move supplies with ease by providing an all-in-one solution for robotics education classrooms. The utility rack features an integrated steel counter top to work as a robust classroom work surface and includes 3 sets of rails for storing VEX IQ storage bins and 1 customizable shelf. The shelf is extra wide, allowing enough space to store any extra VEX product supplies you might need, including 2 additional storage bins. The shelf also features tie-down points for custom configurations for organizing VEX robotics parts, such as VEX IQ battery charging stations. The utility rack shelves sturdy 16 gauge steel construction features a 200 lb weight capacity, making it more than capable of handling all of your classroom equipment. The VEX Utility Rack from RackSolutions is the perfect solution for classrooms and teams using VEX equipment. See the relationship between VEX Robotics and RackSolutions. 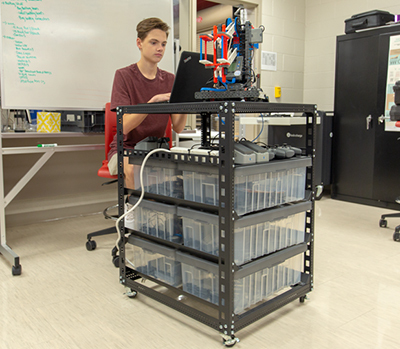 Designed with 3 sets of rails to hold 6 VEX IQ storage bins and 1 additional shelf for storage and customization this Rack is perfect for storing all of the VEX competition and classroom kits. Locking casters provide this rack with added mobility around the classroom while the steel countertop can work as a robust classroom surface.